Paleo and Digestive System Pain: is Stress the Culprit? Gut pain: if you have it, you know it. It might feel like something is twisting, squeezing, or pinching inside your stomach. It might be hard to pin down to one specific place, or feel like a general dull pain in the entire stomach area. It might or might not come along with nausea and vomiting. But it’s always incredibly unpleasant, and it affects a huge number of people. Gastrointestinal pain can be a symptom of all kinds of things. But a lot of people go to the doctor for it and then get a shrug because the doctor can’t find anything wrong. Often this comes along with a diagnosis of Irritable Bowel Syndrome, or IBS. IBS is a “functional gastrointestinal disorder,” meaning a collection of symptoms without any obvious physical problems. On top of abdominal pain, IBS symptoms also include bloating, constipation, diarrhea, and other digestive problems. If that’s the case for you – digestive pain for no obvious reason – the real culprit might be stress. Digestive pain is technically called visceral pain, or pain in your organs. Organs like your stomach have pain receptors that are very sensitive to stretching, distention, and inflammation. Stretching and distention: Your stomach stretches to accommodate large amounts of food. Your intestines can also stretch to become wider – for example, having a lot of feces backed up in the large intestine can cause it to become distended. This is one cause of visceral pain. Inflammation: you can see inflammation on the outside of your body if you look at the red and tender area around a cut or burn. If you touch it, it hurts, because it’s all inflamed and tender. In inflammatory digestive disorders, basically the same thing going on, but it’s happening to your gut and digestive organs. The intensity of visceral pain is totally unrelated to the amount of actual injury going on. You can have very intense visceral pain with no physical injury at all, and you can have serious physical damage with no pain. So what does stress have to do with this? Stress and the actions of stress hormones explain why some people feel pain from distention in the gut, while other people don’t. Distention in the gut is actually pretty normal. 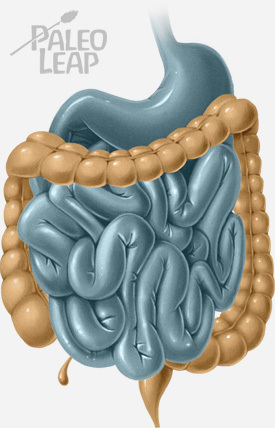 Your stomach gets distended every time you eat a big meal, and your intestine gets distended every time you have gas. That happens to everyone. But only some people feel intense pain from this. Why? It might be because (a) they have higher levels of stress hormones, and/or (b) they’re genetically primed to be more sensitive to those stress hormones. It starts with a stress hormone called Corticotropin-releasing hormone (CRH for short). CRH is released in response to stress, and it seems to make nerves more sensitive to visceral pain. You can get the same effect – nerve sensitization – by injecting a person directly with CRH, but of course in practice that rarely happens. In practice, most of us get our CRH from psychological stress. CRH can increase visceral sensitivity in anyone, but a couple different studies (one, two) have found that people with IBS have genetic differences in CRH receptors – basically, they’re more sensitive to CRH and so the same amount of stress will cause them more visceral pain. That might be why some people can experience stress without feeling any GI pain, while people with IBS do feel pain. People with IBS are just physiologically more sensitive to the CRH signal, so their bodies feel the stress as more painful. People with gastrointestinal pain have a “low pain tolerance,” but it has nothing to do with being weak or wimpy; it’s a physical difference. How Much Stress does it Take? So stress hormones increase sensitivity to visceral gastrointestinal pain. But how much stress are we talking here. Do you have to be in a war zone? Is it enough to be late to work? Probably closer to the latter. This study found that even the stress of being inside an MRI machine could alter the perception of visceral pain in IBS. If you’ve never been inside one, MRI machines are basically what you’d design if you wanted to make perfectly healthy people become claustrophobic and also deaf. It’s like lying inside a very brightly-lit coffin made of white plastic while a loud clunking noise plays all around you. That’s unpleasant, but it’s not violently traumatic or horrifying (to most people). It’s maybe as unpleasant, say, as…sitting in an uncomfortably cold airplane in one of those ant-sized economy seats, or waiting at the dentist while a child screams next to you, or any number of other things that most of us have to deal with every day. The point is that even background levels of stress can affect pain perception and IBS symptoms. It doesn’t have to be extreme or traumatic. In some ways, the people who feel gastrointestinal pain most intensely are the lucky ones. They have a hypersensitive warning signal alerting them to the way stress is affecting their gut – and stress is incredibly dangerous to gut health regardless of whether or not it causes pain. Stress increases intestinal permeability, aka “leaky gut,” one of the major players in immune-related diseases (which by the way include type 2 diabetes and obesity). Stress does a number on the health of your gut microbiome, which affects everything from weight to mental health to allergy risk. These things happen in people who don’t feel the pain just as much as people who do. But at least the people who do get pain have a barometer for the effects. Manage stress. That’s easier said than done, so here are some suggestions: regular exercise, enough sleep, close personal relationships, meditation or alternatives if you hate it, and other forms of damage control. Try reducing meal volume. People with GI pain are often hypersensitive to distention. Eating a smaller physical amount of food might help. Try reducing high-FODMAP foods. FODMAPs are carbohydrates that can cause gas (read: distention, read: pain) when they’re digested. Reducing high-FODMAP foods like onions and garlic may be helpful for managing pain. Avoid gut irritants. They cause inflammation, which is painful. This is all assuming that you’ve been to a doctor and you’re sure the pain doesn’t have a physiological cause. 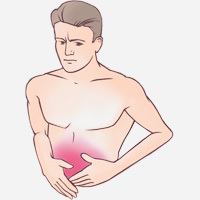 If you’re in pain because of stomach ulcers or something else, the solution is to treat the problem, not just treat the pain, and the first stop is a doctor’s office. But if it’s functional pain (pain without an obvious physical cause), stress might be the trigger, and some of these suggestions might be helpful.